Just thought I would post a pic of the big TX corn I found tonight. When I saw it on the road up ahead I thought it was a Texas Rat, but it looked too heavy bodied! I have caught a few large corns in the east (SC, GA, FL) but they never hold a candle to the big bruisers we get around here. This big boy measured 56 inches (using Serpwidgets Snake Measurer Program) and weighed in at 1160 grams. Just in case you think, "yeah, I've seen stout corns like that" remember - this is a wild caught snake photographed the night it was found! 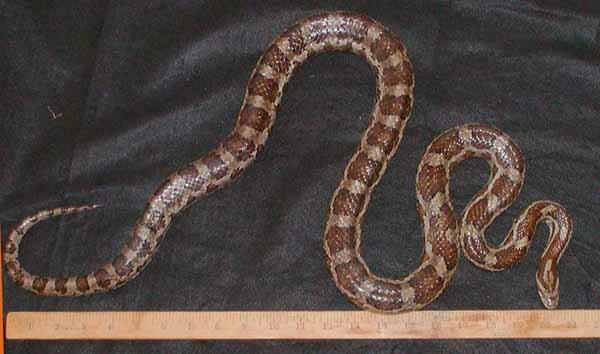 For comparison, I found a large female corn in SC once that weighed 660 grams and she was a big corn snake. I wish I weighed the one I found around here in the early 80s that measured 67 inches. That was a monster!